Handmade and handpainted by artisans, this attractive large Augusta Italian ceramic wine bottle utensil holder can hold a bottle of wine or can be used to hold your kitchen utensils. Made in the Umbria region in Italy, famous for Italian Majolica Ceramics and Pottery. 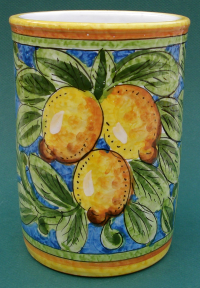 This handmade hand painted authentic Augusta Italian ceramic wine bottle utensil holder measures 7.25" in height and 5.25 in diameter.